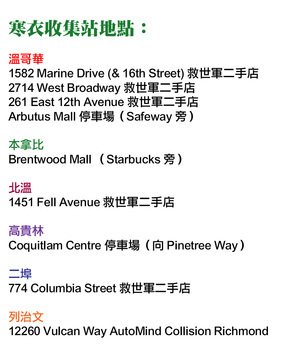 The annual clothing drive for Salvation Army, the "Winter Warm Wave", will be held from Nov 26 to Jan 7 at a total of 9 locations in Greater Vancouver (see addresses of location bins at the bottom of this page). Like previous years, Fairchild Radio will set up a temporary collection booth outside of its office at Aberdeen Centre on Dec 2 and 16, both Sundays, from 12pm to 4pm. Give the Gift the Warmth, donate your unwanted clothes and blankets to help those in need.